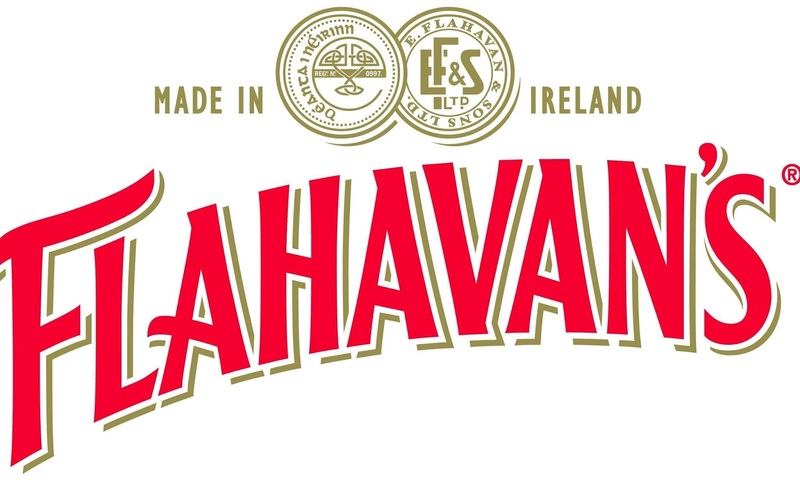 *This post has been sponsored by AppleWeek contributors, including Flavahan's Irish Oatmeal, Rodelle Vanilla and Dreamfarm. 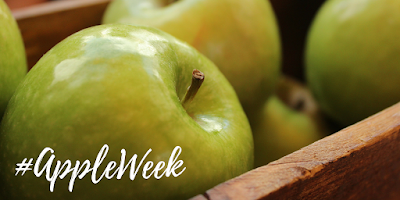 But before I get to the recipe, I've got to share about everything planned for #AppleWeek! Last year was the inaugural year of AppleWeek and the group of bloggers had so much fun that Carlee of Cooking with Carlee decided to host it again, add more blogger, add more recipes and add a fun prize pack for all of our readers! Check out all of these goodies from our sponsors! A baker's dream come true! This delicious prize pack includes premium vanilla products, gourmet dutch-processed cocoa and specialty extracts. Items include: Pure Vanilla Extract, Gourmet Dutch-Processed Baking Cocoa, Gourmet Vanilla Extract, Madagascar Bourbon Vanilla Beans, Organic Vanilla Extract, Organic Chocolate Extract, Almond Extract, Vanilla Paste, and some fun baking supplies to whip up your next batch of goodies with! 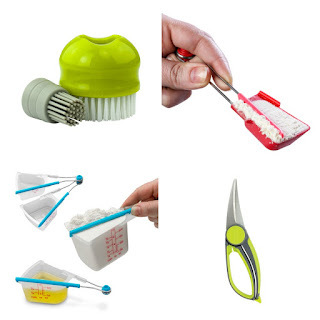 Items include: a 2 'n 1 veggie brush, a clip n strip shears, a set up levups and a set of levoons. 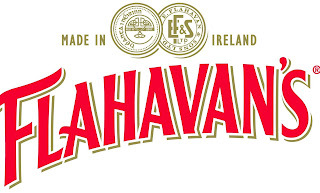 A goodie basket of Flahavan's items. 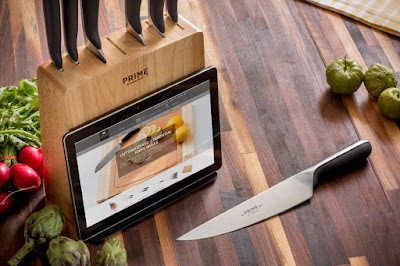 A Prime by Chicago CutleryⓇ 7 Slot Digital Tablet Holder Block. 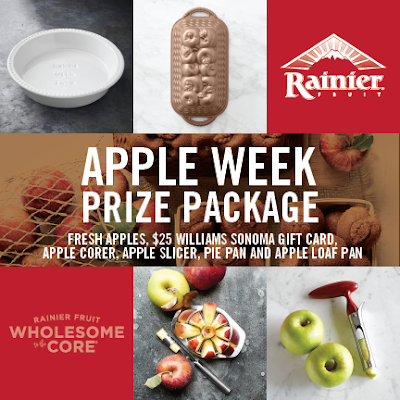 A prize pack from Rainier Fruit including a box of freshly harvested Rainier Fruit apples, a stainless steel apple slicer, apple corer, "Baked with Love" ceramic pie pan, copper apple loaf pan and a $25 Williams Sonoma gift card! A prize pack from Veggie Wash. Thank you to all of this year's #AppleWeek sponsors, and thanks for putting together several great prize packages. I loved working with the different ingredients and kitchen products while developing my recipes for this year's event. 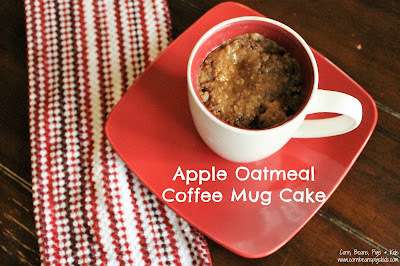 Now onto my Apple Oatmeal Coffee Mug Cake! 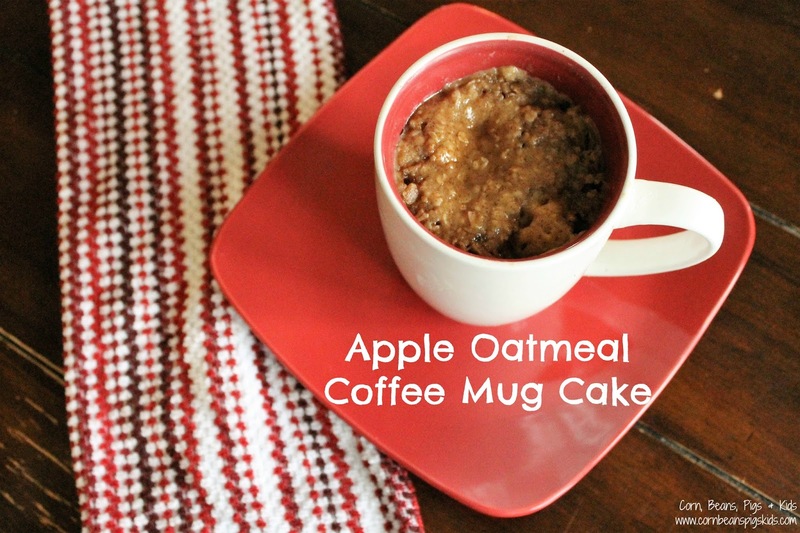 This coffee cake tastes like fall in a mug. With the combination of applesauce, oatmeal, along with the cinnamon and vanilla - it's the perfect way to start off your day. In coffee mug, mix the butter with sugar. Then add the applesauce and vanilla and stir. Next add the flour, oatmeal, baking soda and cinnamon and mix well. In a separate container, mix all five topping ingredients together, forming a wet crumble. Add the crumble on top of the cake in the coffee mug. Microwave for 1 minute 11 seconds (because doesn't everyone just press 111 on their microwave) to bake. Let cool a couple minutes and enjoy! My favorite bite of this coffee cake is when you get a nice helping of the oatmeal topping with a spoonful of the apple coffee cake! Be sure to sign up for our #AppleWeek giveaway this week and to check out the over 100 recipes that will be shared by the time Friday rolls around. I hope this week gets you inspired to do some fall baking! What is your favorite thing to bake in the fall? Do you enjoy making mug cakes? Remember to Comment for a Cause. I don't have a microwave, Val. But, maybe, I'll try this out at my office. LOL. Thanks for sharing with #AppleWeek. It would be a quick snack to make at work then! I like having treats that I don't have to share! This looks wonderful, Val! What a perfect way to kick off AppleWeek! Warm cake for breakfast = Winning. Love apples and oatmeal together! Same here! Great combination and a warm breakfast always hits the spot! Love this is a one serving in a mug recipe!! I might have six people in my family but I love having recipes for just one or just two on hand for a little something special. My favorite apple recipe is any kind of apple crisp! I love apple crisps too. My favorite "crisp" is a Brown Betty! I love a good mug cake! Fall happiness in mere minutes? Yes please! Such a fun way to serve dessert! A great taste of fall! Happy #AppleWeek! I definitely look forward to trying this recipe - love that it makes a single portion, so that I'm not tempted by all of the leftovers in the house! My favorite apple recipe is apple crisp! Love a good apple crisp. I love a good Brown Betty even better! oooh now that's my kind of cake! Love it! thanks for sharing it! Celebrate 365 Blog Parties cake and cupcake party! Looking forward to trying this recipe! oooh now that's my kind of cake! Love it! thanks for sharing it! Celebrate 365 Blog Parties cake and cupcake party! Be that as it may, the cost of such a grinder in the market, including at Amazon and Coffee Machine Online Shop is very costly. We make sure that all swertres result that we post are accurate. However, we still encourage our visitors to visit the official PCSO website and verify the game results from there. Even with the most advanced state of the art CFLs, fluorescent lighting accounts for a high percentage in existing lighting all over the world, switching from fluorescent reklam lighting into LED lighting can greatly reduce the global lighting power consumption and greenhouse gas emissions. Now let's do some detailed analysis to compare LED and fluorescent lighting, and there is no doubt that LED will defeat fluorescent lighting. Even with the most advanced state of the art CFLs, fluorescent lighting accounts for a high percentage in existing lighting all over the world, switching from fluorescent reklam lighting Wishes have no religion like hollywoodneuz.net wishes for Christians are same as that for Muslims and Hindus or Buddhists and all other religion. Another venue you shouldn't miss is the Raffles Hotel Museum. The museum is situated in the Singapore luxury hotel of the same name and is based around the hotel and its beginnings during the Golden Age of Travel. In this time period Singapore was known as the 'Crossroads of the East'. Exhibits include memorabilia of Raffles Ballrooms for rent in Singapore Hotel, Singapore as well as the region during the period. In addition silver, china, postcards, letters and photographs from the hotel are also on display. Several 19th century photographs of Singapore and Southeast Asia are housed in the museum as well and represent an important historical documentation of early life in Singapore. Even with the most advanced state of the art CFLs, fluorescent lighting accounts for a high percentage in existing lighting all over the world, switching from fluorescent reklam lighting Wishes have no religion like you can download all your favorite drama download sites apnetv in different languages wishes for Christians are same . Same here, but it rarely seems I ever get away with it. It always seems I have 1 to 4 extra mouths that at least want a bite koreandramabus.com. This article gives the light in which we can observe the reality. This is very nice one and gives indepth information. Thanks for this nice article.Very interesting blog. All the light fixtures and metal objects are properly electrically bonded within five feet of the pool. The wet niche or underwater reklam lens is suitably installed at least 18 inches below the surface of water in the pool. It must be grounded well via AWG ground connector. Classic Movies. The mid-20th century is also known as the Golden Age of Hollywood, which produced 123movies quite a number of films considered to be defining moments in cinematic history. sansa stark game of thrones Good work friend I read some articles that you posted in your blog.I admire your blog and work. You posted very informative blog. Passport is one of the most important forms of identification of a person in any country and even in the native country of the person. For the purpose of traveling around the or go to a specific country, the person needs this passport so that the person could be able to prove the person is who he is claiming fake canada passport to be and the place of his origin or native country from where he belongs. Ever since the countries have made it mandatory to have a passport to enter into the country. It is impossible to enter the country without possessing the passport authorized by the person’s country. Guide analyzes thousands of articles and customer reviews to find the top-rated products at today’s lowest prices. Best products, best offers. After the launching of the GTA San Andreas this game gains more popularity due to time killing the game. So we thought covering a detailed guide on how to download GTA San Andreas mod apk on your device. tellyevents.com There were a lot of rumblings out there in the video game industry that something major was coming to the Android world.